If there’s one thing we all like to do, it’s play favorites. And once we’ve picked our favorite, there’s nothing like trying to convince someone else that our favorite is better than their favorite and there’s no doubt about it. 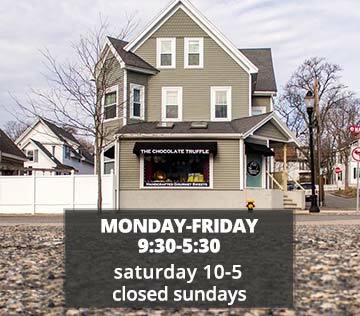 And if there’s one thing we know here at the Chocolate Truffle…it’s everyone’s got a favorite type of chocolate! What actually makes the difference in types of chocolate? It’s that little number on the package that tells you what percentage of the chocolate is made from pure chocolate liquor and added cocoa butter. So what are we dealing with here as far as basic types of chocolate? We’ve got your milk chocolate, white chocolate, semisweet and bittersweet chocolates, and unsweetened chocolate. And from there is where the fun part begins, creating fun new ways to jump off the basic platforms into decadent gourmet chocolate pieces. Milk chocolate is great for snacking. At 10% chocolate liquor, and 12% milk, it’s that melt in your mouth chocolate that gets on your fingers before it hits your tongue. Our old fashioned gourmet turtles make a great milk chocolate treat. Our turtles start with a rich and creamy caramel recipe tested and developed over several decades. Each batch of caramel is slow cooked in antique copper kettles over an open fired gas stove which brings out the rich flavor. We then combine our smooth buttery caramel with cashews and pecans creating the perfect turtle. Once cooled overnight each turtle is then topped with either our premium quality semi sweet dark chocolate or creamy milk chocolate. For the ultra-sweet tooth we’e got your white chocolate. At 20% cocoa butter and 14% milk, white chocolate’s creamy sugary consistency makes for a great after dinner snack! Try one of our delicious truffles in white chocolate. Our truffles are crafted using only the finest ingredients, fresh dairy cream blended with our premium chocolate and infused with the highest quality flavors. The soft ganache centers are then carefully hand rolled and dipped in a premium Belgian style chocolate giving each one a crisp chocolate shell to expose the smooth, velvety ganache inside. The truffles are produced in small batches, in order to guarantee both quality and freshness. Dark chocolate, for those of us that prefer a stronger, more bitter cocoa taste, comes in semi & bitter sweet. At a 35% minimum, dark chocolate ranges up to 80% increasing the bitter taste and crumbly texture. Even so, dark chocolate paired with the right added flavors can make for a delightful treat. Unsweetened chocolate is just that… no added sugar. Not great for eating straight out of the bag, unsweetened chocolate is used mainly for baking to add some more of that rich chocolatey flavor without going overboard on the sweetness. No matter what your favorite, we’ve got you covered. And who knows, maybe it’s time to try a new favorite! We’ve certainly got lots to choose from to satisfy any chocolate craving you could imagine. Try them all!